Introducing the newest member to our campervan family...Beryl! 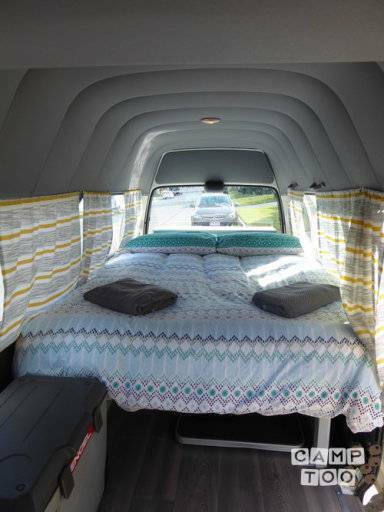 This beautiful Hiace is a dream to drive and has ample room with all your camping needs! Why not take a trip down to picturesque Byron Bay, to the beautiful national parks, or hit the beaches up north on the Sunshine Coast! Solar panels and a dual 12v Battery system so no need to book a powered site. 40L fridge to keep your beers cold! Plenty of storage for your bags and food! There is a minimum 5 day hire period over the Christmas and New Year holiday period. Early pickup/late drop off can be arranged at a $34 fee. Please state when booking. A $15 cleaning fee will be charged at the completion of each hire period. Beryl the Camper was very reliable and well equipped. We had an enjoyable trip away to Northern NSW. Camper went really well, we were only using it as a bedroom for a couple of nights at a friends house, so did not use any of the camp equipment apart from the fridge, which went well. Really comfy bed, warm as toast, in the middle of winter. Everything nice and clean, and the communication with Melita was easy to follow, and exact. Only down side for us was the curtains were a bit lacking on the sides (Huge gaps) so we filled them in with T-shirts and tea towels. Other than that, great wee camper and we will use them again! Melita was super communicative and helpful. Her camper was great: simple but comfortable and ideal for our trip. Hi Melita & Tahnee, loves driving Beryl. Feedback would be to have mossie nets. The noise and heat from the fridge made it necessary to have the windows open but that meant lots of mossies in beryl.